I basically wanted to share Jim Cash’s recent post in this blog post. He writes awesome stuff on computational thinking, Scratch, etc… If you’re on Twitter and interested in this sort of reading, make sure you’re following @cashjim. I just wanted to share the importance of going beyond the hour of code, and a bit of what we’re up to in trying to do so. Last year, we started coding just before the Hour of Code, so not too many people even knew what I was talking about when I asked them to try coding in their classrooms. But things are slowly but surely turning around. So much more awareness has been spread in just under a year since we introduced coding at our board. Last year around this time, we had Lisa Floyd from Fair Chance Learning up to keynote and put on sessions at our 2nd Annual Google Student Summit to add a little coding spice to the day. With the help of CODE and the TLF, we had a small group of teachers explore coding in various forms, also with the help of Lisa Floyd. This idea was inspired by a colleague and friend of mine, Stacey Wallwin. She did this last year with awesome success, and is of course doing it again this year. Thanks Stacey! As we approach the Hour of Code, don’t stop there. As mentioned above, Jim Cash’s post provides five great examples of how to do this. We’re just starting with a coding blitz of sorts to start the ball rolling – but it’s really only the beginning. All students need to be provided the opportunity to code; what we need to do is at least give them a chance. Once you do so, however, be prepared to be blow away in so many ways. I thought I’d share quickly my thoughts and experiences with EDSBY so far. Initially, for years, our school board was trying to find ‘the one’ – a gradebook for our secondary school that met our needs: web-based, user-friendly and intuitive and of course, had potential for data analysis. After a test run and a few demos with EDSBY – sold. It took many, many, many years to adopt our previous gradebook at the high school in a manageable, effective manner. It took a couple of months with EDSBY. But EDSBY is becoming more than just the gradebook solution. Kind of a funny story; I was sitting with an elementary school during a PA day last month with the plan of showing them an overview of EDSBY later in the day. That plan quickly changed. During the first fifteen minutes as I arrived, the staff were all sharing important dates verbally and – yes – they were each writing them down in their own notebooks! The first thing I showed them that day was the staff room group, highlighting the shared calendar built into it. We have been fortunate enough to have been part of EDSBY’s new evidence of learning tool test group. During the first week of school, we gathered all of our kindergarten teams together and spent about one hour showing them EDSBY, as well as the Evidence of Learning tool. I honestly can’t do it any justice – hop over and check out their Evidence of Learning page by clicking here. After about a month and a half of introducing this teachers, it’s been a huge success! Teachers are excitedly waiting for parents to have access (they will very soon!) so that they can share student learning back home. EDBY’s Evidence tool is the only thing I tend to use. I find it easy to document, link expectations, and choose whether to take a picture or retrieve one from my photo library. 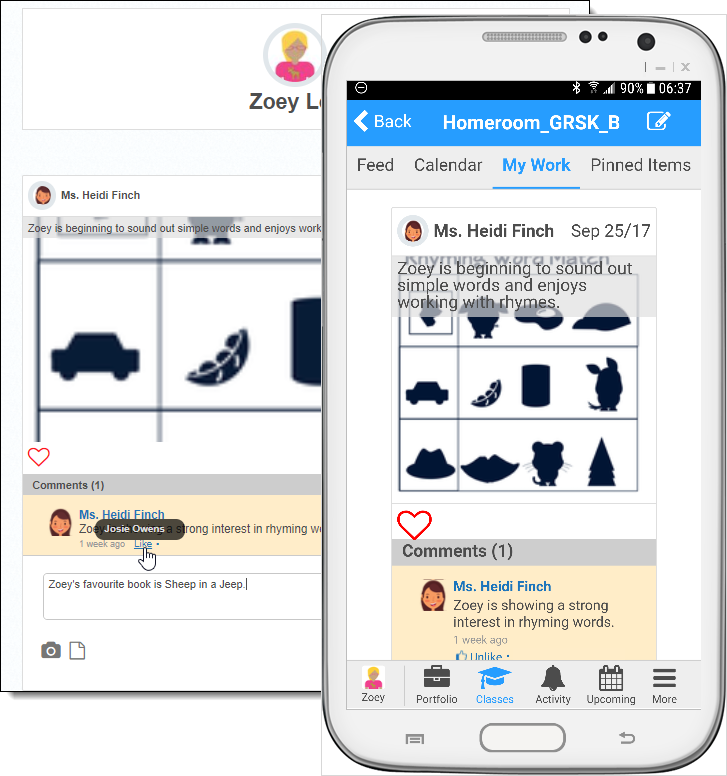 After a successful test-run of reporting using EDSBY in the spring, the upcoming reporting period is happening next month, and kindergarten teachers are using EDSBY for progress reports this year! 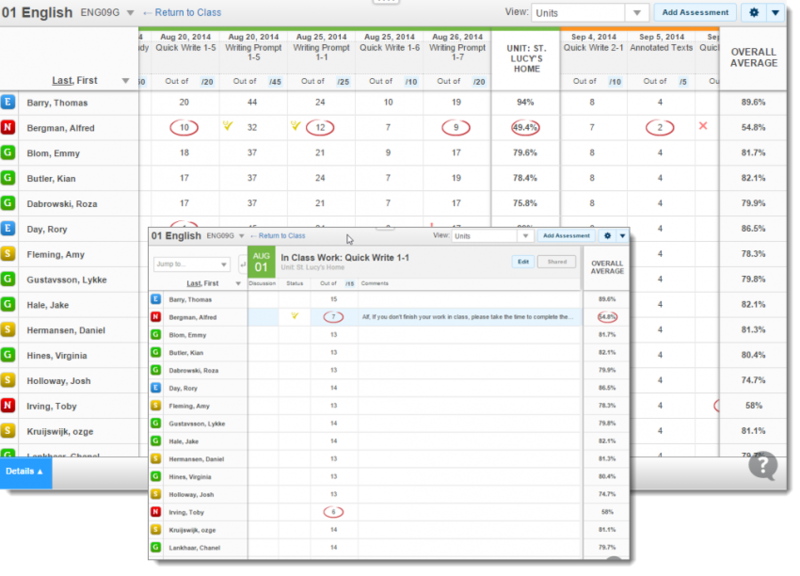 We’re also hoping to have a few teachers in grades 1-8 use EDSBY for report cards in January. Stay tuned. EDSBY has huge potential. As with any system-wide change to any process or organizational structure, there is a fear of leaving what’s comfortable and working. We’re bound to run into a hiccup or two as well along the way. With goals in place and a vision for what can be possible – a ‘most-in-one‘ shop for many administrative processes, overcoming these fears and hiccups are inevitable for – what appears to be – the adoption of an amazing K-12 platform. I will continue to share our EDSBY journey here both for my own reflecting as well to share any successes and failures – but there won’t be any, right Karen? 🙂 . This massive worldwide event is dedicated to promote awareness of computer science for people of all ages, and to shed light of how important it is for our younger generation to become adept in languages that will likely be in their fields of study in the future. It really is an awesome thing for both students and staff to be aware of and participate in, which Nipissing-Parry Sound CDSB classes did just that. Last week was arguably the most fun I’ve ever had in this role. Visiting schools and classrooms across our board, seeing students and staff so engaged and excited about learning computer science, regardless if it was introductory coding activities through code.org and Google CS First, the fire has been set! The media even visited us for an hour of code, and were also amazed by the engagement that was evident. But this can only be the beginning. The hour of code can’t be a one-off, however, or you might as well not even bother; it has to be the beginning of a journey. This journey can be for the students, or yourselves as leaders, or better yet – both! This year so far I have mistakenly overfilled my to-do list with ideas that I want to try this year as we explore computer science and it’s effects on student achievement and engagement. For starters, from coding in elementary to intermediate classrooms using Scratch JR, Scratch, Makey Makey and Spheros; how do these tools fit? Do they? Being such a new journey for me, I find myself struggling trying to make a manageable to-do list as I want to go full steam ahead with everything that I’m seeing. That’s where having thirteen teachers, spanning grade 1 to grade 8, coming together to investigate these such things in a collaborative inquiry will make this a rich learning experiment. One of the key people inspiring me as I’ve mentioned in my previous post is Lisa Floyd. A recent post of her’s entitled Carrying the Momentum Surrounding Coding (Code On! ), encourages different entry points into coding such as tutorials and remixing other projects. She also tells people to not be afraid to jump into the world of coding. There is an amazing network of people out there to help and when in doubt, ask your students! So yes, the journey is still in the early stages, and I along with teachers in our CI group can’t wait to dive into this after the holidays!